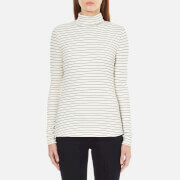 Women's monochrome striped jumper from Gestuz. Crafted from soft stretch fabric, the 'Emelda' features a roll neck, long sleeves and a curved hem. Tonal stitching throughout. 95% Viscose, 5% Elastane Model is 178cm/5'10 and wears a size S/UK 8.